From now on, the BlueMelon users and their visitors can enjoy a new design when viewing their photos. The main changes affect the way the photos and the additional photo information are displayed. In the photo view, the photo is now centered and using the whole of the available browser window area. The side-panel heretofore containing the information about a photo has been removed and a new movable panel has been created instead. This panel is not visible by default and it can be displayed by clicking the new "i" photo button which you can see when you move your mouse cursor over a photo. Once this panel has been displayed, you can freely move it whereever you want and you can also hide it again. The content of the panel is divided into tabs and the album owner can choose which tabs to have displayed for each album ; the available tabs are : Info, Keywords, and Exif. If you choose not to display any of the tabs, the info panel will not be available to your visitors. 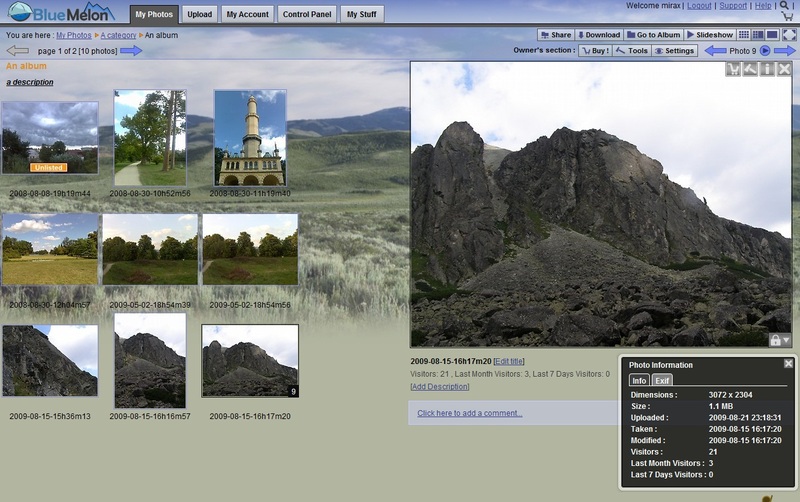 The Info tab contains the general information about a photo, such as its file size, dimensions, dates and optionally the number of visitors to have viewed it ; the Keywords tab displays and makes it possible to change the keywords assigned to the photo ; and the Exif tab contains the Exif information extracted from the photo. Another of the changes is the new way you can set your photos' access mode : there is a new icon in the bottom right corner of the displayed photo which displays a drop-down menu with the available access modes and after clicking any of these, the photo's access mode will be updated. You can see a screenshot of the redesigned photo view below. 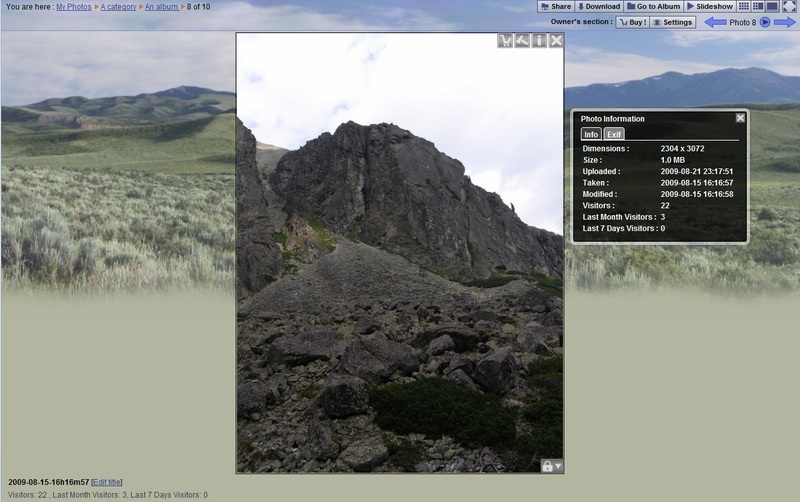 Similar changes have been made in the combined view : until now there was no information panel in this view but the new panel is now available here as well ; you can as well set the access mode using a like of the above-mentioned button in the bottom right corner of the selected photo ; and the photo is not restricted and more of the available space is used. You can see the new combined view in the screenshot below.